Hello, and welcome to E-Bikes 101 (#8): Electric Bike School! In our last module, we created our first ever tutorial on how to assemble a rear rack for your Biktrix E-Bike. Today, we have prepared another tutorial, regarding how to mount your motor on your e-bike. There have been a few customers who wanted a step-by-step assist, so here is a blog our valued customers can use for reference! At the end of the steps, there is link to a video for a Tongsheng TSDZ2 mid-motor onto your e-bike. Please note that the bike in the video is NOT a Biktrix bicycle, but our e-bikes can be assembled and disassembled the same way to fit a Tongsheng mid-motor onto our bicycles. 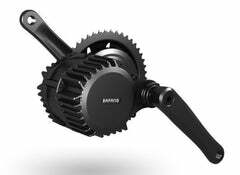 Our Bafang motors come already on the frame with our newer models, but the same rules apply for older models if you ever need to install your Bafang motor. Step 1: Remove your chain from your crank set. Step 2: Remove your crank arms from your bike. Step 3: Remove your bottom bracket. Step 4: Fit the Tongsheng motor through the bottom bracket shell. If the housing does not fit snugly against the bottom bracket shell or if it is interfering with the chain stay, add spacers until it does not. Step 5: After installing the retaining plate, use a grease to lubricate the threads, tighten on the lock ring with the provided tool. Step 6: If there are too many spacers to install the lock ring on the non drive side of the motor, the motor is not compatible with your bicycle frame. There will be two M5 screws included in the kit along with two silver spacers. If you have a 68 mm bracket shell, you will not use any spacers. If you have a 73 mm bottom bracket, you will use those spacers between the retaining plate and the motor mount. Step 7: Locate the crank arms, identify left and right. Lightly grease the square tapper ends of the crank shaft and install the crank arms. Step 8: Put the chain around the chain ring. Step 9: Install the display on your handlebars then run the cable to the motor. Attach it to a cable that will receive it. (There should be only two cables - one to the speed sensor, the other to the display). Step 10: Locate your speed sensor, connect to the remaining cable coming from the motor. Run the cable along the chain stay until the speed sensor is at a point where the magnet when installed on a spoke will be at least 1 cm away from the sensor. Step 11: Connect your battery to the motor. Step 12: Turn on the motor. You must test the bike by riding it. Torque must be applied equally to both pedals. The assist will not work if it is in a stand. However, you can check if the speed sensor works by spinning the back wheel. The speed should appear on the display. If it does not, adjust the position of the speed sensor for the magnet. When going to test the motor, do not apply force to the pedals while turning on the motor. The motor calibrates the zero point of force as the force being applied to the system on startup. Here is the link to the video, courtesy of CNE Bikes on their Youtube channel. Please contact us if you have any questions or concerns regarding this tutorial. Thank you for reading, and stay tuned for our next module!